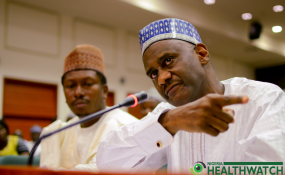 Barely eight months after the reinstatement of the Executive Secretary of the National Health Insurance Scheme (NHIS), Prof. Usman Yusuf, by President Muhammadu Buhari, the governing council of the scheme has again suspended him indefinitely. The Chairperson of the council, Ifenne Enyanatu, who announced the suspension at a press conference in Abuja yesterday, said the decision was reached after a two-day meeting of the council members. She said the council resolved to suspend Yusuf because it has been inundated with petitions of fraud and infractions, adding that the council has set up an administrative panel to examine allegations leveled against him. THISDAY gathered that he was also suspended because he has on several occasions refused to carry out some of the board's decisions. The chairperson said: "The panel has three months to complete its assignment and report back to us. "The suspension is to allow the panel have adequate space to do a thorough investigation. "We consulted and got the approval of the Minister of Health, Prof. Isaac Adewole, before this suspension." Enyanatu also announced that Mallam Sadiq Abubakar will act as Executive Secretary in Yusuf's stead in the time being. Yusuf was in June 2017 suspended by Adewole over allegations of corruption but was recalled in February 2018 by President Buhari who was away on a medical leave in the United Kingdom when he was suspended. He was at the time accused of corrupt expenditure to the tune of N292 million which he allegedly spent on health care training without recourse to any appropriate approving authority. They accused Buhari of preferring ethnicity to competence and ignoring the report of a panel that indicted and suspended Yusuf of fraud. THISDAY had in April this year broke the news of the ES's interest in investing at least N25 billion of the scheme's funds in government securities through Cowry Asset Management Limited against advice from the Ministry of Health and its finance counterpart. Yusuf, 54, took over the government-run health insurance provider on July 29, 2016. But his reign at the agency has been fraught with graft controversies.